Nowadays pest management companies use a variety of chemicals named termiticides for the protection of buildings and structures. Historically the organochlorine insecticides aldrin, dieldrin, chlordane and heptachlor constituted the major means of providing protection against subterranean termites. These have been used as chemical barriers and also in direct applications to manage termite infestation. These chemicals were marketed as economical and effective, and good for long-term protection. It has been the Saudi Government’s policy to phase-out and remove these chemicals where alternatives were proven to be even more effective. Aldrin, dieldrin and heptachlor are no longer used to control termites in the kingdom. Chlordane’s application has been restricted over the past few years to situations where alternatives are not yet considered to be proven effective for local conditions. Chlorpyrifos has been registered for a number of years for the prevention of termite attack under suspended floors where retreatment is possible and also for use as a perimeter spray. 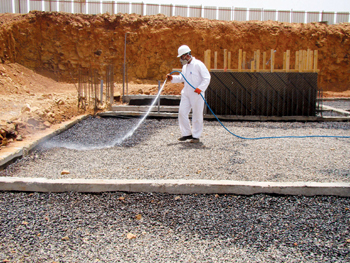 In 1994 approval was given for the use of chlorpyrifos treatment under concrete slab-on-ground construction. This was carried out initially via a reticulation system installed prior to the laying of the concrete to allow retreatment. In 1995 the direct hand spraying of chlorpyrifos for treatment under concrete slab-on-ground was approved. There are concerns that the use of chlorpyrifos on alkaline soils would result in only a transient protection period due to alkaline hydrolysis of chlorpyrifos. In approving chlorpyrifos, there were significant concerns raised regarding the increased occupational health risks of using more acutely toxic chemical by hand spray and at times in confined spaces. Chlorpyrifos has been available in the kingdom since long years and is registered for use as a termiticide. It is a toxic member of the OP class of chemicals (oral LD50 in rats is reported to be in the range 96 to 300 mg/kg body weight), capable of acute cholinergic poisoning typical of the cholinesterase inhibitors. It is relatively non-volatile (comparable to heptachlor and chlordane) but is reported to give out a mild mercaptan odour which can be felt after treatment of dwellings. Apart from their potential to cause acute poisoning because of their inhibition of cholinesterase, concerns about the OP class of pesticides, including chlorpyrifos, relate to their potential for chronic effects (ie effects after repeated exposure), even if one-off exposures are small. These include their possible visual toxicity, neurobehavioral toxicity and delayed peripheral neuropathic effects. The organochlorine termiticides have long been recognised as a cause for environmental concern because of their persistent properties and tendency to bio-accumulate in wild life. These concerns led to the phase-out of their remaining termiticide uses. Impacts on wild life, the environment and public health from the use of persistent organochlorines have been evident in recent years. Now government authorities and organisations have banned these chemicals for the use of termite proofing. Bifenthrin is a synthetic pyrethroid that has recently been registered for use against termites. Currently it is only approved for pre-construction treatment by hand spray. A number of other chemicals have been trialed in the kingdom. These include isofenphos and prothiophos as well as alpha-cypermethrin and esfenvalerate. Other pyrethroid and organophosphates have also been trialed. The companies have not proceeded from trial work to commercial development for a number of reasons including a lack of efficacy under climatic conditions or a lack of commercial viability. In general, using other chemicals such as permethrin depends on discovering the nest and treating it directly. Many termite species which are successful in the urban environment do not generally build nests. The replacements of cyclodiene termiticides (some of the so-called ‘organochlorine’ ones) with alternative chemical barriers are not without occupational and public health risks. On the basis of the high acute toxicity of the OPs and the fact that required treatments of houses by pest-control operators (PCOs) need to be much more frequent than with the cyclodiene formerly used, it is suggested that there is a greater risk of poisoning events, involving both PCOs and possibly householders and /or their pets. The use of new technologies which include monitoring and baiting to chemically kill termite colonies promises to dramatically reduce the potential exposure of PCOs and householders to termiticides. Masa is using Raslan Plus 30.5 per cent SC – active ingredient imidacloprid - which belongs to a new chemical class Chloronicotinyls. It is a systemic and contact insecticide for the control of termites in buildings and can be used both for pre- and post-construction treatments. Raslan Plus 30.5 per cent SC is odourless and has relatively low toxicity towards people and pets; it has contact and systemic action and impairs the physiological activity of termites. Termites stops feeding and get killed within a few days. It spreads in all directions by a process called “lateral soil movements (LSM),” ensuring thorough soil coverage. The imidacloprid active ingredient is considered by the WHO to be moderately toxic. In laboratory animals, symptoms of acute (short term) oral exposure to imidacloprid included apathy and laboured breathing which lasted for five days. The LD50 for imidacloprid (an oral dose that results in mortality to half of the test organisms) is 450 mg/kg body weight in rats and 131mg/kg in mice. The 24-hour dermal LD50 in rats is > 5,000 mg/kg. It is considered non-irritating to eyes and skin from tests on rabbits. Imidacloprid has gained registrations in about 120 countries and is marketed for use over agricultural crops as well. 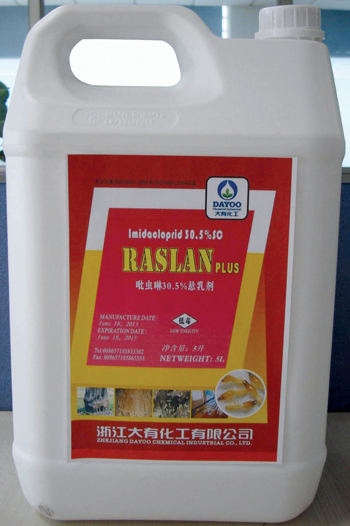 Masa is the sole distributor of Raslan Plus 30.5 per cent SC in the kingdom. It is the preferred termiticide of leading construction companies and consultants as it is user- and environmentally friendly. There are comparatively fewer call backs, resulting in satisfied homeowners. Specifically it causes a blockage in a type of neuronal pathway (nicotinergic) that is more abundant in insects than in warm-blooded animals (making the chemical selectively more toxic to insects than warm-blooded animals). This block leads to the accumulation of acetylcholine, an important neurotransmitter, resulting in the insect’s paralysis, and eventually death. Masa methods are based on 36 years of service to the public and the environment. To protect the health and environment, Masa is using the safest techniques, equipment and pesticides that leave no residue. The recourse is to apply not more than what is required and the risk of pesticide spillage is minimal. The company is a member of 13 international pest control associations and exerts every effort to boost public awareness about pest hazards on premises while urging the public to cooperate with a professional pest control operator to maintain a healthy environment.